Are you a medical student interested in Emergency Medicine? Do you wish to learn how to handle medical emergencies through modern education methods including simulations and hands-on teaching? Then don’t miss this great opportunity to participate in the Emergency Medicine Summer School 2017 (EMSS17). 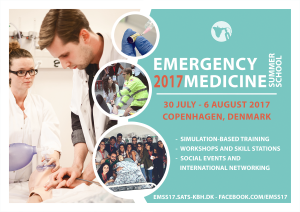 The summer school takes place at the Copenhagen Academy for Medical Education and Simulation (CAMES), the largest simulation centre in Denmark and Northern Europe, from July 30th to August 6th 2017. If you want to read more about their prior events, see the webpage for EMSS15 (http://emss15.sats-kbh.dk) or this article about another of our full-scale simulation courses, Trauma Days 2013 (http://www.trendsanaesthesiacriticalcare.com/article/S2210-8440(14)20050-5/abstract). The EMSS17 team looks forward to see you Copenhagen!